As you know I will be leaving for Australia in 2 weeks to teach in Brisbane and The Beating Around The Bush convention in Adelaide. 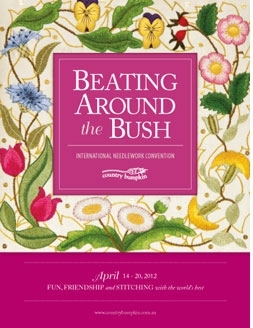 BATB is an international embroidery convention hosted bi-annually by Country Bumpkin, the publishers of Inspirations magazine. You can read all about the event here. I am almost packed and ready to go, but as I will be leaving my 10 year old daughter in the capable hands of my husband there are a further few things “To Do” before I leave. Preparing frozen meals, school lists, homework and important phone numbers. I have told them that due to the time difference of approx 8 hours I will not be reachable during daylight hours, so please don’t phone me and ask how to work the washing machine! Seriously, my husband has been known to phone me in the middle of a class and ask how to turn the oven on and how long he should leave the lasagne in for:) Having said that he is a star and I could not do this without him. I will be closing my website sales next week and off the radar for the next month until my return at the end of April, so if you need to place an order please do it soon, thanks. The preparations for this event have been going on for almost 18 months now. Having accepted the invite to teach at BATB from Ellaine Bronsert part of the editorial team at Country Bumpkin, I was then sent an outline of the requirements for teaching and asked that my proposals be submitted within a few months ready for placement in the catalogue. THe catalogue is published almost 9 months prior to the event to give the students plenty of time to sign up for classes and if the tutor’s class is filled they can then go ahead and make travel arrangments. Sally Bradshaw took on the job of 2012 BATB Co-ordinator and was responsible for co-ordinating the flights, accommodation, visas, class layouts etc for all the teachers, some of whom are local and some coming from overseas, UK, USA, Canada and South Africa. One can only imagine the amount of work this involves, coping with individual teachers requests. I know I was one of the offenders who emailed her every couple of weeks with queries and she always responded in a timely, friendly fashion. Nothing was too much trouble, thank you Sally. It all came together eventually and this was purely due to the fantastic organisational skills of the co-ordinators. It is a very scary prospect arriving in another country and not knowing what to expect, so it is essential to have good communications with your host to avoid any confusion as to what is provided and what is required. I need not have worried however, everything was clearly outlined in a contract, telling us exactly what was catered for, flights, accomodation, meal allowances, transport to and from the airport, sales of products etc were all taken care of by the hosts which meant that I was able to concentrate on the main event – teaching. In the meantime I got busy stitching up my class projects, doing instructions, ordering in materials for class kits, preparing notes, going to the printers, packing up the kits and arranging for them to be shipped over in advance of the event. There were a few anxious moments where my fabric supplies got lost, there were problems with my visa application and not knowing if my class materials would arrive safely, but it all panned out in the end. So the next time you attend a workshop at a convention and you see the smiling face of the teacher, calmly welcoming you into the classroom, kits placed neatly at your table you will know what really went on behind the scenes to achieve this! 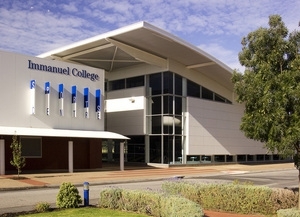 What I am most excited about is the beautiful venue where the event is to be hosted, Immanuel College in Adelaide. The classrooms are kitted out with all the latest technology projector, electronic whiteboards etc which is a delight for me as I don’t have to lug all my equipment on the plane. When I tentatively approached the school asking about the layout of the classrooms, the College facilities co-ordinator, Emilia Bekiaris, emailed right back with all the details and even offered to loan me her laptop computer for the duration. I was so impressed by her kindness and helpfulness. 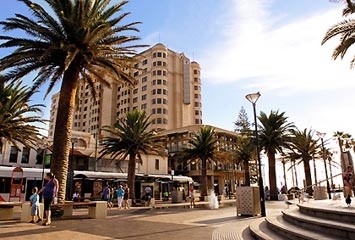 We are being accomodated in the Stamford Grand Resort Hotel in Adelaide which is right on the beach, so if the weather allows I may even get to go for a stroll on the beach after classes! BATB runs from the 14th – 21st April and although the classes are closed for bookings I believe that they may still be able to accommodate you in some of the classes. From a students point of view it will be a week to remember with workshops, lectures, meeting like minded people, and generally having fun. There are several evening events and lectures and everyone has the day off for a bit of retail therapy at the Stitchers Fair on the Wednesday. 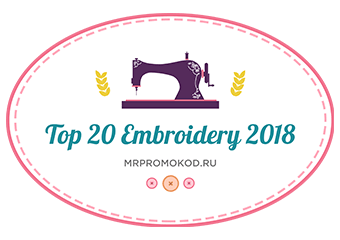 I like to think of it as an embroidery sleepover where we get to eat, sleep and breathe the thing we love most without the interruptions of daily life! To the students who will be attending my workshops, I look forward to meeting you there. I hope you have all have received your preparatory notes and if you have any questions or concerns please feel free to email me. I plan to take lots of phots and will report back on part two of the BATB convention on my return at the end of April. Meanwhile, have a wonderful week wherever you are and happy stitching. Hi Trish, I’m looking forward to attending your Fairy Wren class in Adelaide. I’ve admired your work for a while, so decided to take the plunge and start learning! I’m new to this technique, but have been practicing with a few of your smaller designs to get a feel for it, and with much help from your DVD. Look forward to meeting you in a few weeks; I’m travelling down from Singapore for the convention. Have a safe trip, Karen. Perhaps you can put child and husband in a kennel for the duration of your trip. Have fun … and while you’re resting on the airplane, do me a favor and dream of a barn owl design. Ha Ha Marny that’s hilarious! Looking forward to you being “Downunder” Unfortunately my commitments mean I can’t attend your workshop – my favourite is the bluebird which I hope to work one day. 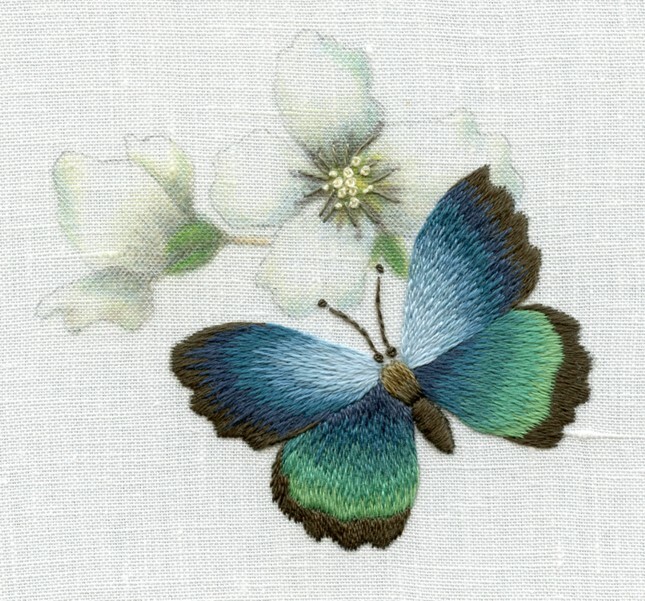 I look forward to your blog and your book “Needle Pinting Embroidery” is most helpfull – I have done several projects. Have a good trip and I will look forward to you comments.